WASHINGTON, September 6, 2018 – The National Retail Federation and 150 organizations representing U.S. retailers, manufacturers, farmers, technology companies, natural gas and oil companies and other industries today submitted comments to U.S. Trade Representative Robert Lighthizer on the administration’s proposed tariffs on $200 billion of Chinese imports. 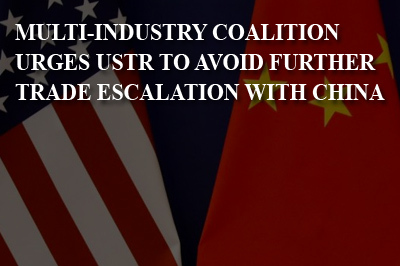 The groups urged the administration to avoid further escalation with China and warned of the negative impact of tariffs on American businesses, families and workers. The groups expressed concern over the administration’s suggestion that the United States might impose tariffs on all Chinese imports. The letter said imposing a 25 percent tariff on a total of $250 billion in Chinese imports — including both tariffs that have already gone into effect this summer and those currently under consideration – would result in $62.5 billion in tariff costs for U.S. businesses and consumers each year. By contrast, the U.S. government collected only $33 billion in total tariffs on all global imports in 2017. In addition to the coalition letter, NRF submitted its own comments to USTR regarding the impact of tariffs on retailers and consumers.